This idea has been floating around for awhile and appears in many write ups about the park, but it seemed far fetched. Why would we drag a big chunk of concrete across the country for the City’s Jubilee in 1936 instead of building it here? The August 8, 1936 Vancouver Sun carried a story called ‘Secrets of the Fountain’. 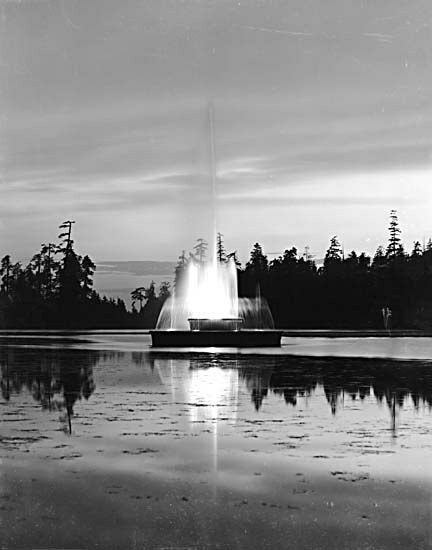 In there it talks about Robert Harold Williams, Chief Electrical Engineer with the Vancouver firm of Hume and Rumble Ltd. who conceived, designed and supervised the construction of the fountain. It took the draining of the lagoon and the setting of 70 some-odd piles into the lake’s bottom to get the fountain built. Sometimes the real story is just way more fascinating. Yes its true. I have done extensive research on the fountain and found many newspapers articles and in my grandfathers collection his photographs, letters and stories. He was in LA in 1932 when he was inspired about a fountain and the rest is history. As to a fountain from Chicago, I have pictures of the framed rebar all placed in Lost Lagoon ready for the cement, from his collection. Why all these stories came out is because my Harold died suddenly in the 50’s at a young age of a brain tumour and being a modest man he never looked for gratitude or recognition. Then I saw another man saying it was his, shame on him, so I wanted to set it straight for my grandfather since he can’t stand up for himself. I even met the man, little old man now so I was very nice, holding in my anger for what he had done. I hope Vancouver residents and visitors for many more years can enjoy this vision of my grandfather for many more generations.